Yep...it has been a while, hasn't it? Sorry 'bout that! First thing, I want to thank a couple of patrons who donated a bit to El Bloggo...the first donation came in within twelve hours of the first appearance of the Paypal button. So, as a token of thanks, here's a great (if somewhat forgotten) side by the Claude Thornhill band. 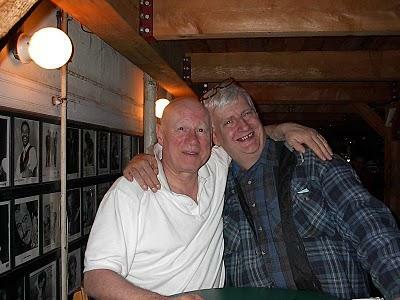 In late April, my Scrabble-playing friend Jawn took me to see one of my all-time heroes, Neil Innes. I've been a fan of the Bonzo Dog Band since I first heard them, around 1974...Dr. Demento played them and I was hooked immediately. Neil did a one-man show...one of the best shows I've ever attended, I might add. 'Twas a terrific "unbirthday" present, my friend...thanks again for taking me! Anyway, I met a couple of folks at the show and we shared a table. Rob and I immediately started talking about old records and musicians...and Rob's wife and Jawn both thought that it was amazing that our tastes were so similar. A couple of days after the show, Rob donated a double-sawbuck to the blog...and here's a thank-you song for him as well...I know that Roger Ruskin Spear (another ex-Bonzo) did this song on one of his solo LPs. I just happened to have the song on my hard drive. NYC 16 January 1929: Large dance band...a young (18!) Artie Shaw is in the sax section. Oh, what the heck...here's the flip side! It's a dandy version of a (soon-to-be) standard. Whew...now the dedications are out of the way! Again, I thank my patrons...wish I had more of them. 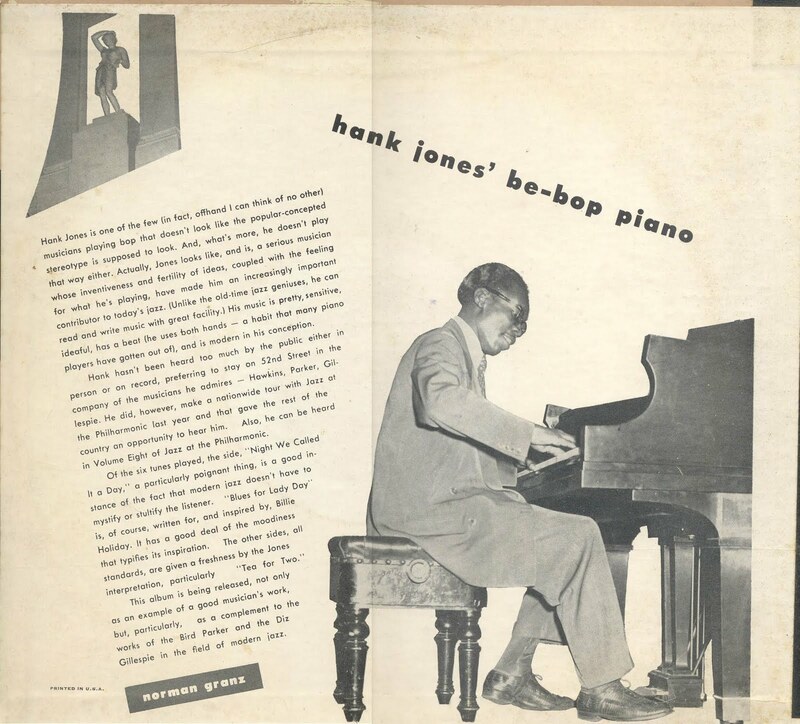 A few weeks ago, Hank Jones died at the ripe old age of 91. He was active pretty much until the end. I thought I'd present one of Hank's early albums...it was recorded in 1947. "A Lady Day?" Were there more than one? The only Lady Day I know was Billie Holiday (No, Doris doesn't have that nickname, although I'm sure she's a very nice lady). And I wonder how "traditional" this blues is...it's probably a Jones original. Now for something completely different (hmmm...another Python reference! )...my pal D Burns (who celebrated a birthday last weekend!) let me borrow a rather amusing Edison Diamond Disc by Billy Jones and Ernest Hare. One side has the 1923 hit inspired by the popular comic strip, Barney Google (Yes, I suppose you could Google Google is you wanted to...). NYC, 13 April 1923: Billy Jones and Ernest Hare vocals; with orchestra. NYC, 17 April 1923: same personnel. Those sides are a lot of fun, aren't they? Now, here's where things start to get a little weird. NYC, 14 April 1923: Jones and Hare, vocals; orchestral accompaniment. There's a bit of confusion regarding the recording dates. The Abrams database gives 13 April 1923 for both Columbia sides, which is also the date for the Edison Google. Were they in two different studios (singing the same song) on the same day? FLASH! Luis wrote in to say the Columbia Master Book gives the following day, 14 April as the date. My date has been corrected. Thanks! Also, it appears that Jones and Hare (also known as The Happiness Boys and The Interwoven Pair, after their hosiery-making radio sponsor) were free-lancing in the recording studios...they appear on just about every label in the 1920s. I suppose I should mention here that there's an extra verse on each of the Edison recordings that aren't on the Columbias. Even with those extra verses, those are fairly short performances for Edison...Diamond Discs often contain around five minutes of music per side. A few days later, Columbia recorded Frank Guarente's Georgians (a small jazz group taken from Paul Specht's band) doing their versions of those two songs. And, wouldn't you know it, Columbia had to issue these versions back-to-back, too! It appears that another friend of mine, Victrolaman, has posted his copy of the Edison Tut on Youtube! http://www.youtube.com/watch?v=jJr85QVsYf8 (notice that Billy Jones inserts a little laugh at the 0:41 mark that's not on D Burns's copy). With all the back-to-back stuff, perhaps we should sing a quick chorus of Zombie Jamboree? 'Til the next time, and avoid any strange curses, okay?